Role 상품을 이용하여 권한을 체크하기 위해서는 RESTFUL API 를 호출하거나, Client SDK 를 이용하여야 한다. Spring Framework 을 사용하는 경우, 좀더 편하게 JAVA Client SDK 를 사용할 수 있다. RESTFUL API 와 Client SDK 를 사용하려면 AppKey 와 Secret Key 가 필요하다. [CONSOLE] 의 좌측 상단에서 발급된 Key 정보를 확인 할 수 있다. Spring Framework 을 이용한 MVC 프로젝트에서 JAVA Client SDK 를 좀 더 편하게 사용하기 위한 @Annotation 및 Interceptor 를 제공한다. RESTFUL API 에 대한 접근 제어를 한다면 Spring Client SDK 를 사용 함으로서 손쉽게 접근 권한을 검사할 수 있다. Spring Client SDK 에서 제공하는 @Annotation 과 @RequestMapping 같이 사용하게 되며, @RequestMapping 의 value 가 Resource Path, method 가 Operation ID 로 각각 mapping 되게 되며, @Annotation 의 설정에 따라 User ID 와 Scope ID 를 Path Variable, Query Parameter, Header 의 특정 값으로 mapping 할 수 있다. JAVA Client SDK For Spring 을 사용하기 위해선 pom.xml 에 maven repository 및 depencency 설정이 필요하다. [applicationContext.xml] 에 TCRoleClientFactory 를 등록한다. [mvc-config.xml] 에 TCRoleControllerInterceptor 를 등록한다. Spring MVC 프로젝트의 @RequestMapping 의 권한을 체크 하기 위해서는 아래 예제와 같이 @Authorization 을 사용한다. 만약 권한 체크에 실패한다면, InvalidAuthInfoException 혹은 UnauthorizedException 을 throw 하게 된다. Spring Framework 의 @ControllerAdvice 의 ExceptionHandler 를 등록하여 적절한 에러 체크를 구현해야 한다. AuthParamType AuthParamType.STATIC @AuthParam 의 value 를 직접 사용한다. - AuthParamType.PATH_VARIABLE @AuthParam 의 value 를 Path Variable 의 키로 사용하여 값을 얻어온다. - AuthParamType.HEADER_PARAM @AuthParam 의 value 를 Header 의 키로 사용하여 값을 얻어온다. - AuthParamType.QUERY_PARAM @AuthParam 의 value 를 Query Parameter 의 키로 사용하여 값을 얻어온다. RESTFUL API를 손쉽게 호출하기 위한 Role 전용 Client SDK 이다. 자체 Cache 기능을 가지고 있기 때문에, 좀더 효율적으로 Role 상품을 이용 할 수 있다. 현재는 JAVA 언어에 대해서만 지원을 하고 있다. JAVA Client SDK 를 사용하기 위해선 pom.xml 에 maven repository 및 depencency 설정이 필요하다. // 아래처럼 직접 생성자를 호출하면 안된다. TCRoleClient 의 생성자를 직접 호출하지 않도록 주의한다. 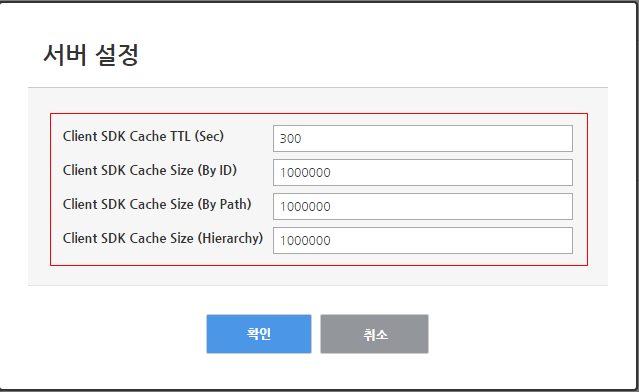 Client SDK 에서는 아래 3가지 경우에 대해서 각각 Client 단의 Cache 를 사용한다. LRU 로 관리를 하고 있으며, Cache 의 기본값은 300초의 TTL (Time To Live) 과 1,000,000 개 Size 이다. 해당 값을 수정 하려면 [CONSOLE] 에 접속하여 변경할 수 있다. [CONSOLE] 에서 변경한 설정은 변경 즉시 반영되며, 변경되는 즉시 기존 Cache 는 모두 삭제된다. ROLE 의 데이터를 Atomic 하게 추가 / 변경 / 삭제 하고 싶을 경우에는 TCRoleClient 객체의 beginTransaction() 을 호출하여 TCRole Session 객체를 얻어와 사용하면된다. 예를 들어, 아래와 같이 여러개의 Role 동시에 등록할 경우 중간에 에러 발생 시 몇개는 등록이 되고, 몇개는 등록이 안될 수 있다. // U1 은 R1 권한만 가지고, R2 권한은 부여되지 않는다. // 에러시 자체 Rollback 로직을 구현해야 한다. TCRoleSession 객체를 사용한다면, 위와 같은 상황에서 부분 실패를 없앨 수 있다. // 만약 여기서 Exception 이 발생한다 하여도, 부분 실패는 발생하지 않는다. // 에러가 발생하지 않았다면, 서버에 변경사항을 반영한다. // 에러 시, rollback 한다. TCRoleSession 객체를 사용 시 commit() method 를 호출하기 전까지는 어떠한 추가 / 수정 / 변경사항도 서버에 반영되지 않기 때문에, commit() 하기 전 변경한 데이터를 읽지 않도록 주의해야한다. TCRoleSession 객체를 commit() 하거나 rollback() 한 다음 다시 재사용 할 수 있다.